Step 3. Spread desired topping on bread. Step 4. Place bread into gyoza mould, fold over and press firmly to enclose. Gyoza moulds, also known as empanada or dumpling moulds, are available in kitchenware shops and Asian grocers, or online. They come in a variety of sizes, so adjust recipe accordingly. 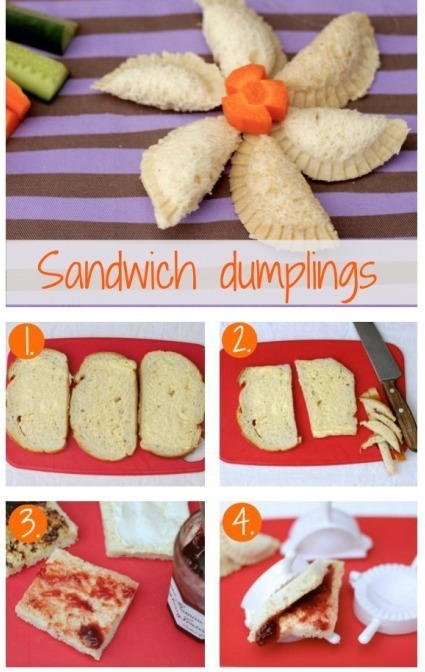 You may be able to make two dumplings from one slice of bread. These Stained glass window sandwiches also involve cutting off the crusts which make them perfect for kids that are crust-resistant. These Swirly sandwiches make a great surprise in a lunch box. You can even get the kids to help you with these for a weekend lunch treat. You can also make Skyscraper sandwiches for party platters and use your favourite fillings. Party platters can be made with your favourite characters like these The Very Hungry Caterpillar sandwiches. Don’t tell the kids there are veggies in these Veggie cream cheese spread pressed sandwiches. They won’t even realise as they tuck into these creamy bites. Grape on sandwiches? YES! When paired with chicken they give a fresh burst of juicy flavour and the kids will love the novelty of these Chicken and grape party sandwiches. These Easter bunny sandwiches aren’t just for Easter. The kids will love these bunnies all year round.